Pros: I appreciate the pay-as-you-go option and not having to be locked into a contract. Our company is changing systems, so the no-contract option is best for our current situation. The customized templates making sending text messages so easy. The Block feature is comforting that we won't accidentally text a customer who stated did not want to receive text messages. I really love the Scheduled Text feature. This allows me to prepare the list of texts early in the AM and have them delivered after a certain time or divide the customer messages in spurts instead of all at once. I also like to see the text replies right in Text Magic. Cons: This isn't necessarily a con because I don't know if it's possible, but I wonder if TextMagic can be integrated with the new account system that we get next year and automatically send text messages under defined account conditions. Overall: TextMagic makes it easy for us. Every day we text an unlimited number of customers whose insurance premiums have changed. Our customer express appreciation for the text message. We had no plans to incorporate mass email, as our company focuses on business text messaging services. If this changes in the future we will definitely update our customers. Cons: Unnecessary feature - The email notifications that someone unsubscribed to your messages. If I get a text that says "STOP" from the person sending it, then I don't need an email telling me that they sent a message saying STOP. It's redundant & unnecessary. Overall: Not getting notifications that a message wasn't delivered is a detriment to Text Magic and my ability to do my job effectively. Our text message program with our customer base is pivotal to success within my company so it's vital to know if messages are reaching my customers. Thank you for taking the time to share your review. We highly value our customers and their feedback. We are sorry to hear that our unsubscribed recipient notification is not useful for you. For your information, all email notifications can be modified under your account settings. To improve this feature, we will add the "Unsubscribe" option to our sent notification email so that you can turn off this notification with a single click. Unfortunately, we do not send an email for each failed message due to limited server resources. We recommend that you keep track of the delivery rate via TextMagic Web App by checking the message status in History or checking the overview under Reporting. You can also enable a notification to receive a daily report of your messaging statistics and go to your message history with a single click. Should you have any delivery issues in the future, please do not hesitate to email us: support@textmagic.com. Pros: The customer service is excellent. I don't recall the woman's name, but it was the best customer service I have ever received for any product, in a literal life or death situation. Overall: It was August 28th, 2017. Hurricane Harvey had landed in Houston and was causing a record amount of flooding. People were dying, and thousands were still trapped in their homes. I made a simple website for my buddy's church, so his friends could keep track of all of the parishoners that needed rescue. The website quickly went viral however, and soon the entire city was using it as a way to track the rescue cases. Rains continued to pound Houston, and what started as a simple website that I made in 6 hours now was literally the only thing standing in the way of death for thousands of people still trapped by the rising floodwaters. We had a problem, though. Some of the people were getting rescued but not being marked "SAFE" on the site. This resulted in wasted resources, as rescuers would would go to a house and find nobody there, the homeowner having already been rescued hours earlier. We had to come up with a solution to this problem. Luckily, we had all of their phone numbers, so we decided to text them all. It was 2 AM in Texas, and I needed to have it done overnight because we were expecting more waves of signups in the morning. I tried Twilio but nobody answered the phone or replied to my urgent messages. Luckily, TextMagic picked up the phone and I got a working account in minutes. We sent out thousands of SMS overnight. TextMagic was there when others weren't. We ended up saving 25,000 people that week, a number which would have been smaller if not for TextMagic. Pros: I love the fact that their SMS delivery rate are almost at 100%. The SMS length calculator is very useful and helps in saving costs. Their pre-build SMS templates are very useful and helps save time and copy-writing efforts. Best of all, the multiple numbers from which the SMS can be sent, if not the most sought Custom Sender ID, for optimal branding. Cons: I would appreciate that the prices get lower, or packs for unlimited SMS's for a day for example, were available. Overall: I managed to launch successful promotional and communications campaign, and have the message get right away to the targeted audience as compared to other means where the message opening rate is low (email) or where the message gets lost in a flood of content (social media). Great experience. I definitely recommend. Overall: We build websites on a pay-on-performance basis, whereby instead of paying for a website to be built and then paying again for it to be optimised, our customers only pay for the new business enquiries we generate for them through the site we build them. We charge per new business enquiry, so we wanted to find something where we could notify our customers (largely tradesmen) by text, providing caller details when they'd missed a call, or to send them notifications relating to their account. TextMagic was the final piece in the jigsaw for us and our overall service is loved by our customers. Many complimenting us on 'our' missed call text service. We started using TextMagic in 2010 and this has been one of the best and lowest maintenance relationships we have ever had. I'd go as far as to say our business wouldn't be the same without it. Pros: I like that there's an app and you can keep business related texts in text magic while using the default text app for personal items. Cons: It needs an update to allow picture messages to be sent. Our business requires paper copies of things to be sent to us and once in a while our clients text documents to us which text magic doesn't currently support picture messages. Not asking for video or files but picture messages would be a huge upgrade. Unfortunately, TextMagic does not offer the MMS feature at the moment. However, you can add an SMS attachment to your message - it will be sent as a download link inside the text message. We will definitely announce if this feature becomes available in the future. Cons: It would be nice if the account could be suspended during the summer instead of incurring fees even when not in use. Overall: It has helped us keep in contact with our parents. Should you have any further questions, please contact support@textmagic.com. Pros: The software is super helpful and easy to use. It sends texts very quick and lets you know if it was delivered and received. It's much easier then picking up the phone to call someone for a simple issue. It is also very affordable. Cons: It's difficult to print an entire text conversation. It would be easier if when you hit print on the browser it printed the whole screen. Instead it jumbles up the text and you can't see the whole thing. (I use Google Chrome) I usually screen shot the page and print it in word, which makes it very tiny. Same thing for individual texts, you have to download them to print. Just an extra step, but could be easier. Overall: Love it!!! Best source to have in the business. Pros: TextMagic is highly reliable as a communications provide. I've been using this software since 2001 and never had a single issue with it. The text message service is perfect with a delivery rate of 99.9%. Great features when it comes to Custom Sender ID, contact list building and reporting. Cons: My only little remark with TextMagic is the price. It should get lower, to be more affordable, and if not, offer some daily, unlimited packages for example. Overall: I am yet to find a match for TextMagic, possessing the full power and capabilities. TextMagic is the best. I definitely recommend! Pros: Works great, no issues with people getting our messages. 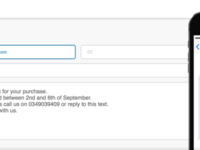 We can easily send bulk texts to customers for their order reminders. Cons: Price & lack of desktop notifications. I'd like it to constantly remind my employees they have a message to respond to on the desktop but we are forced to use the browser app to sync between work stations.. and browser notifications are not working. I also wish we could do a template it auto-inserts for the start of every chat/text. Text message notifications are now working, thanks to our new desktop app. As long as you¿re signed in to the desktop app, you¿ll receive notifications. If you¿re using SMS Chat in your browser instead, just make sure you leave the tab open. You can create a template and add it with one click anywhere in the body of the message. Please contact our support line if you have any questions or feature requests. Pros: It does one thing and does it flawlessly. Overall: I run a website that grew from a personal hobby to 3 million monthly users. I have monitoring scripts that use TextMagic to send me text messages whenever something unexpected happens. In addition, I have a home server running all kinds of smaller pet projects that also send out text messages on certain conditions. TextMagic works flawlessly every single time. In two years, I never once had a SMS fail to go out. Textmagic has become an essential tool for running our business. Pros: It allows us to send text messages from the office using a full sized keyboard and to store incoming messages along with emails. Cons: Nothing at all. It does everything that we need. What more can we say without waffling! TextMagic has changed the way we do business. It is so much easier to get in touch with our clients. Pros: The best thing about TextMagic is its ease of use. Simply enter the phone number you wish to text and type out a message. Then the messages show up in a chat format making keeping in touch with clients a breeze. This has saved us hours of time on the phone. It is also nice to have preset forms to quickly enter saving even more time. Cons: I guess one feature I wish it had was a desktop format we could just open without needing to keep an internet page open. Overall: This product has saved me both time and money. And as we all know time is money, the reality is it has saved me money. Very relyable software for sending SMS through e-mail, we endorse it to all our customers. Cons: It would be better if they where better known in Europe, than it would be easier to recommend it to our customers. For the rest not a single thing. It does what it has to do without unneccesary options. Pros: After growing the business beyond the capabilities of my iPhone keyboard for texting customers, I moved to TextMagic because of its Zapier integration and simplicity. Works as expected, is simple and very well thought out. - If you set up seperate roles under the same company, you can't see who has replied to which text, this is on an individual login basis. Like I said there may be reasons for this design, but it doesn't work with my company and workflow so we've had to share the password to the main account. A minor issue in the scheme of things. Overall: A central text messaging platform that allows a whole team to send and reply to text messages from anywhere. Very simple, and has stopped my phone buzzing and no longer need to pass out my personal phone number. Pros: This program was found by accident through a google search. Try the free phone number lookup for the customers cell vendor. Then I was able to use the composing text messages for customer that did not have a voice mail set up or not accepting calls. Cons: The whole program is paid for but only .04 cent a look up. I would like to let you know that incoming messages are always free for you. You are sending messages from a sender ID (your business name), and this is why no one is able to reply to you. If you need a two-way SMS service, you should send messages from our shared or dedicated number. I recommend you to contact our support line, if you have any questions. I have used other texting software, but this was by far the easiest to learn. Pros: I love how simple it is to import contacts and make lists for every category I need. I also love the ability to set up a text to be sent automatically on a day that you may not be in the office. The ability to make templates saves so much time too! Overall, I love this product and can't imagine one beating it. Cons: The only thing I do not like is that it sends the texts in multiple text messages. I wish there was a way to increase the number of characters in one text. Sometimes when the receiver gets the message, it is out of order and can be hard to read. Overall: Increases the number of people I can contact in less time. Pros: It is an intuitive solution, the interface is user friendly. It was easy to implement into our custom CRM. It is a cost effective solution because it is realiable and demand very little attention once it is set up. Pros: We've been using TextMagic for a few years now, always working, never had any issues. Very reliable. Dashboard is good and easy to understand. Cons: They don't have the best SMS prices in the marketplace BUT it is a very reliable service. No ther issues to mention really. Pros: The software is user friendly and it's a great way to keep in touch with clients. It's effective and easy to access. Overall: I'm not one to talk over the phone. I love technology for this. I give my clients to option to keep in touch by phone, email or text. Most clients prefer texting so this software gives me the opportunity to keep in touch with them. Overall: Even though we only have five guest rooms, it's great to receive a text to tell us about each booking. We often use these texts when we're updating our calendar, because we can see in an instant every booking that's been made, most recent first. Pros: Great text system - Magic! Advanced warning of bookings via text, reliable system, very economical & accurate system. Cons: Nothing at all, it all. Works fine for my needs, nothing negative at all! Pros: It just works and the ability to use templates makes our day to day process much faster. Cons: nothing , whats not to like, the software works exactly how we want it to. Overall: We are a property management company and our monthly rent collection and arrears is quickly resolved by texting our tenants! we have have seen a 75% increase in arrears collection when switching to text. Thanks Text Magic! Overall: I don't have a co. cell phone, so can't send/receive text messages.....It is easy to use, & incoming messages also come in my email. Easy to send group messages. $$ well spent. Customers also like it. TextMagic is the easiest way to manage your SMS messages - one or thousand(s). Comments: We have excellent experience with TextMagic service so far. It's very easy to use, both manually and as integrated part of our website. Price is reasonable and the support is always ready to help you. We strongly recommend them! Pros: The customers I can't get by calling - I can get by texting. Cons: I suppose I could complain about it not being free, but that would be silly. Pros: Easy to use, cost-effective and provides a character count. Cons: No alert when you've run over character count. Contact listed by first name instead of last. Overall: I despise texting so much that I have had the feature removed from my cell. Unfortunately, I'm in the minority; many people prefer to receive a text over answering a call. TextMagic provides a perfect solution. Pros: Quick, simple and extremely professional. Very easy for people, like myself, of a certain age to use. Pros: Easy to use. Reasonably priced. Just works. Has an app so we can answer wherever. Cons: No cons at all it all just works as it should work. Overall: We offer customers the ability to text us for quick answers. We text customers if we have a mobile no. (with delivery info). Means no chance of our delivery instructions going to Spam. Overall: Whenever I have to liaise with Text magic, I always am treated individually and with respect, efficiency and professionalism. High ownership and very personable. Pros: Seamless integration & excellent support team. We have used it for more than 2 years now & it has never let us down. Cons: some of the features are a bit clunky I have a list of clients who I message every week and I feel that the service could be slicker in managing this type of use. Pros: Text Magic is very easy to use. Able to quickly text contacts and save templates to help increase efficiency. Overall: We have been using Text Magic sinc 2009 for urgent communication with our extended network of translators worldwide. Pros: Ease of setup, billing, and overall functionality. Cons: I have nothing bad to say. Overall: We switched to TextMagic just over a year ago and couldn't be happier. It makes track conversations with our customers simple, and is easy to set up. It is also a great value and based on the volume with which we send texts, has been a wonderful resource. We are sincerely sorry that your data was deleted. Again, we wish to assure you that your data was deleted by the person who logged into your account and was not the fault of TextMagic or its employees. We have also restored all the information that this situation caused you to lose. TextMagic can set up account permissions for you to avoid situations where data is accidentally deleted. If you need more help with this type of situation, please let us know via support@textmagic.com and we will be most happy to assist you. Pros: It's very convenient to use with business/customers. It allows you to keep your personal contact information separate from your business contact information. Cons: No complaints about the software, everything has worked well for me. Overall: By implementing TextMagic into my business it has given my younger generation of customers the ease of access my business in a way they prefer. Having the option of receiving text messages via email is convenient when I am at my desk using my computer during business hours. Having the option of texting from my computer (while using a full keyboard) is more productive than via my smart phone using one finger to type! I personally highly recommend TextMagic outstanding services. Pros: Option to use web, app, or email. Cannot use our company's number as the assigned number. Having to pay extra for each user.. Overall: My upper management is really happy with the results. Some coworkers love using it, especially opposed to using their own cell phones. Pros: From sending timely notifications to conducting a mass promotion Textmagic is all you need for your SMS needs. It has a very user friendly interface that helps to push text messages to client, customer or employee on time everytime. Overall: It has made the SMS marketing service easy and handy for my organisation. Thank you for taking the time to submit a review! We highly value our customers and their feedback. Our auto-unsubscribe feature allows you to make sure that your messages to a certain contact will be rejected after a specific number of failed attempts. Easy to use, helpful, and quick. Pros: You can create templates if you're sending the same message over and over. You get to see when the message has been delivered. Cons: Would be nice if there was a pop up to tell you if someones number was incorrect. There is no spell check. Overall: Easy to contact customers as they don't always have time to answer phone calls. Pros: We use TextMagic to organize sales and sale follow up campaigns .It is really easy to set up and you get a lot for the cheap price you pay. Cons: I would love if a feature for it to be integrated with different CRMs was available .It would make the process that much easier . Thank you for your feedback. Please send us an email to support@textmagic.com with more information about the CRM software you would like to be integrated with TextMagic. Please kindly note that TextMagic can be easily integrated with the most popular CRM software using Zapier. It is very simple to set it up too. Please let us know if you need help with the setup. Pros: It is so easy to use, everything is so easy to use. Cons: This is a difficult question! But must be that it cost money to send texts! Overall: I am connecting with the US leads through TextMagic, but if I have leads anywhere I could send to them anywhere! Cons: None really. Would like it to integrate with my other systems but hey, what can you do. Overall: Does what it says on the tin! Cant get any easier and we just love the way it works with templates. Keep up the good work! Recommendations to other buyers: just get it. Cons: Unfortunately people don't know me from the very occasional random message I send, they only know my phone number. Overall: I use this as an alternative to my phone as the latter can have difficulties maintaining service while my trusty iPad stays active. Very limited usage but it has been very good to date, thank you. The customer support is very helpful and always answers within 24 hours. They have helped us a lot. Pros: I like the history and sender settings. The functionality have improved during the years. Especially important for us has been the increased number of local/country specific shared numbers for two-way communication. Cons: The functions are not working intuitively. My collaborators have had difficulties is buying credits, setting up the sender settings. There might be too many options wisible.